We need to believe that God is capable of creating a new church that carries forward the best of the old, a future church we will love just as much as the church of the past. But how can we know that it is God who is leading? God went in front of the children of Israel as a pillar of cloud by day and a pillar of fire by night, guiding and lighting their way. We long for such clear signs. We want skywriting, like “Surrender Dorothy” in the Wizard of Oz. How can we tell the difference between being led by a roundabout way and being hopelessly lost? Part of how we can make sure God is leading us is to keep looking to God to teach us the way. Continuous metanoia is the spiritual practice of turning back to God in prayer in every moment when we catch ourselves getting distracted. Praying, studying sacred writings and seeking spiritual direction from a wise counselor are the classic ways to discern if we are hearing God’s guidance correctly, but the Psalm says that torments are another thing that will tell us if we go wrong. How can this be if Jesus suffered torments while innocently following the Spirit? I lived one summer in a cluster of cabins you could reach only by foot, walking a well-worn path across a hay field. Everyone living in them was young, and we used to walk the path in bare feet, and go without a flashlight at night. I learned that by going without light I could find the path by other means, night vision sometimes, or the good feeling of the cool dirt on the bare soles of my feet. If I strayed, the not-good feeling of sharp timothy stalks caught between my toes told me I was off the path—the torments of the wayward! There is a difference between the torments Jesus suffered in the wilderness while being faithful to God and the torments that someone suffers who has left God’s path, but either way, suffering is suffering. We need to imagine Jesus in the agony of temptation, we need to imagine that he was craving what Satan offered him, or else the temptations and his triumphant struggles with them are meaningless. This could be confusing and disheartening—if even Christ suffered torments, what is the use of our trying to follow his path, if we are going to suffer either way? But our situation is both simpler and more hopeful than that sounds. We do not really need to know whether we are suffering because we have gone off the path or suffering because the Spirit has led us into a wilderness of trials. Either way, the needed response to our suffering is the same. Turning back to God is the right response to every struggle. As Paul said in Romans, “all things work together for the good for those who love God,” (8:28) whether we are on the path or have momentarily strayed. I found another way of seeing the path without sight when I was crossing that field every night. I found an intuition, an inner sense of where I was, that I would not have known I had if I had not put myself in a position where I needed it. Our church covenant promises that we will look to the Holy Spirit to lead us, but how often do we listen instead to our own opinions or tradition or other persuasive voices around us? Our wildernesses, our times of greatest trial, confront us with the inadequacy of all voices but the one higher power that can save us. Wilderness trains us to hear the still, small voice of the Spirit within and among us. Our healthy communication circles help us hear the Spirit among us when we are sitting together focused on a difficult question. 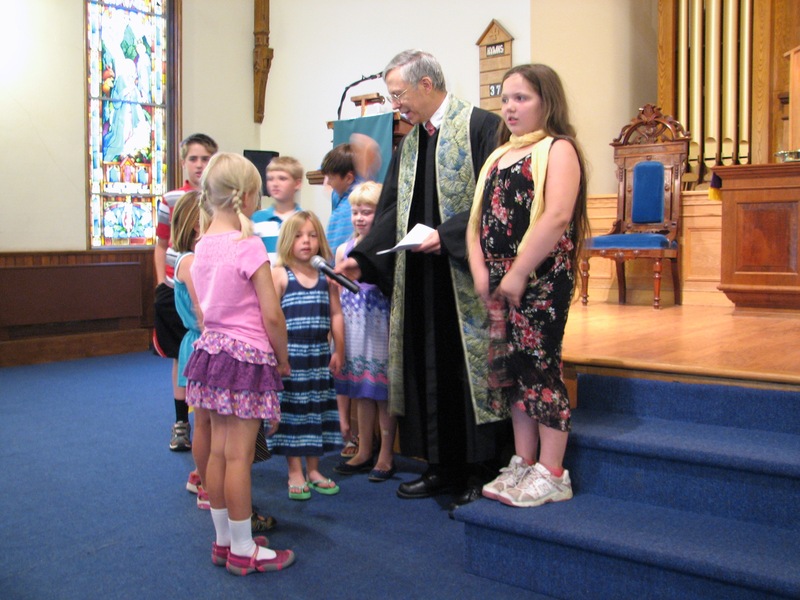 It can happen in other congregational meetings as well when people are listening carefully and respectfully to one another. Time and time again I have seen a meeting stand momentarily lost, not seeing the way forward on a hard issue, when suddenly in a corner of the room a voice will speak up with exactly the wisdom needed to move forward. That is the Holy Spirit at work. Churches need the Spirit more than ever. Every church in our society is in an interim and wilderness time today in a real sense because our society has become a desert where winds of rapid change have made the landscape unrecognizable, and the sands are still shifting. Many people today have different spiritual wants and needs, especially the younger generations. They speak a different language from the traditional church, they use different media than hymnals and bulletins, they listen to different music, they structure their week differently, they have different ways of intersecting with community and organizations. 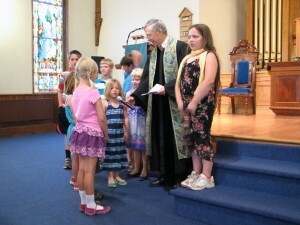 They are looking for congregations that boldly practice what they preach as models for their children. They are looking for churches that have learned to resolve conflicts and differences through healthy communication, churches that are filled with a feeling of positivity and beloved community. Wilderness is a life-threatening place. Some of you may remember the death of Bishop Pike in 1969 in the same wilderness where the Spirit led Jesus. Churches that once thrived in fertile fields with all the people and resources they needed now face the choice to lie down and die in the wilderness or seek the Holy Spirit’s leading toward a new Promised Land. Of course, a church could suffer and die following the Holy Spirit, too, as Jesus did on the cross, but we know that Easter miracles can happen when we empty ourselves and turn our will and our life over to God’s care. We need to believe that God is capable of creating a new church that carries forward the best of the old, a future church we will love just as much as the church of the past.